St Thomas More was born into an upper-class family in London. He was educated at St Anthony’s School, deemed “one of the finest available”. Between the ages of 12 and 14, he was an attendant to the Archbishop of Canterbury who nominated him for a place at Oxford University. There he studied classics and became fluent in Latin and Greek but left university after only two years for a legal career. He later joined the bar in 1502. 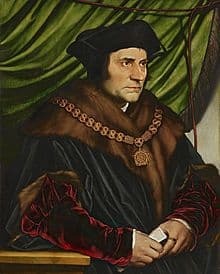 St Thomas More was elected to Parliament in 1504 and henceforth began a long political career to the office of Lord Chancellor. However, it came to an abrupt ending after he opposed the King’s marriage annulment to Queen Catherine of Aragon, refused to attend the coronation of Anne Boleyn as Queen of England and opposed the supremacy of the crown which belittled the Papacy. For these acts, St Thomas More was tried for treason and executed. Pray for us that we will remain firm to our faith throughout our lives.